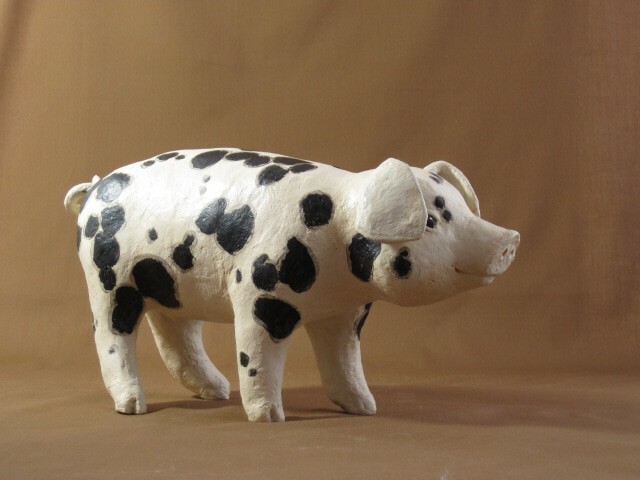 Thank you for your interest in my new paper mache book Make Animal Sculptures With Paper Mache Clay. If you have any questions about any of the projects or techniques in the book, this is the place to ask. I try very hard to answer every question on my blog, and my other readers are generous with their time and creative ideas. This is a blog where we all have fun learning together. I also hope you’ll show us your finished projects in the comment section below. Q. Can I use Elmer’s School glue for my paper mache clay instead of Elmer’s Glue-All? A. No – one of my readers already tried that, and it didn’t work. Rona Simon tells us that the school glue makes the clay an odd texture – like tuna fish. Q. Do I have to use Linseed Oil in the clay? Will some other oil work just as well? A. The boiled linseed oil will affect the texture slightly, but the clay still works just fine without it. Linseed oil is a drying oil, unlike most other types of oil. If you don’t want to use boiled linseed oil, or you can’t find it at your local hardware store, just leave it out. Q. Do I need powdered joint compound or the kind that’s already mixed? A. Buy the kind that’s already mixed. It usually comes in a plastic tub, and it will last for months if you keep the lid on tight. One gallon costs about $6 at my local hardware store, and that’s enough for many quarts of paper mache clay. Q. What is “joint compound” called in my country? … I just wanted to let you know that joint compound in Germany is called Fugenspachtel. People from Germany should go to a so called Baumarkt and ask for Rigips (this is the major brand in Germany). Ingredients: VARIO Fugenspachtel is a high plastic-improved gypsum-based filler as per DIN EN 13963 / Typ B4. (just one of them). One will have to make a decision between about 20 different types of Fugenspachtel. Q. Joint compound is not sold in my country. Can I use powdered gypsum or calcium carbonate, instead? A. Several readers have tried making their clay by mixing finely ground gypsum with a bit of water to make a paste, and then using it in place of joint compound in the clay recipe. Tani say it works. However, when I tried it, the gypsum wasn’t ground finely enough and my clay ended up lumpy. I suppose that means that you will need to experiment with locally available products, and see what happens (be sure to tell us how your clay turned out). Or, it might be easier to use a commercial or “instant” paper mache product from the art store, instead. 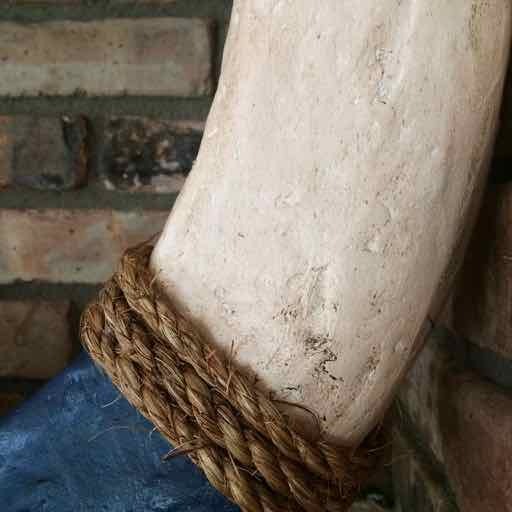 The commercial products don’t work exactly like the paper mache clay, but they may be close enough – many people use products like PaperClay with excellent results. A. The paper mache clay has not been tested in a laboratory, so it can’t be called “archival.” The recipe was created to replace traditional paper mache made with strips of old paper and a paste made from flour and water. Since papers are made with a variety of chemicals during the manufacturing process, traditional paper mache methods aren’t really archival, either. ( However, paper mache items made over 100 years ago often show up on eBay). If you’re a professional artist, I recommend that you do some tests of your own to make sure the finished sculptures will meet your standards. Without expensive laboratory testing, I cannot make any guarantees. Q. Why does my clay feel so sticky? A. I recommend that you use a knife to apply and model the clay, because the glue and flour will make it feel slightly sticky. If your clay feels too sticky, you can leave out the flour the next time you make a batch.Â The flour acts as a filler and thickens the clay, but the clay will work just fine without it. You can make adjustments in the amounts of other ingredients if the clay feels too wet without the flour. Q. Is the clay a good art material for preschoolers? A. I don’t think so. The clay is not edible, and spreading it over a form will be too difficult for very young kids. I suggest that you use paper clay, instead. Be sure to read the section on safety in the book, (on page 14), and read all the warning labels on the products you buy for the clay. Anyone over 8 years old should be able to use the clay safely, with adult supervision. Q. The label on the joint compound says it isn’t safe to breathe. Should I be concerned? A. You should never sand anything made from joint compound (or anything else, for that matter) without a face mask. Sanding creates extremely fine powder that can get into your lungs, and that is not a good thing. You can make your sculptures without sanding, just by being very careful to apply your clay smoothly. To make it even smoother, dip your knife into water and rub the flat part of the knife over the clay after it’s been spread on your form. Or, you can place a piece of plastic wrap over the clay and smooth the clay through the wrap (this makes sure that your clay doesn’t end up being too wet). To smooth the home-made gesso without sanding, use a damp brush or sponge after the gesso has dried. If you do sand, use a face mask. They’re cheap. Q. Can I use newspaper or other recycled paper instead of toilet paper to make my clay? A. Jennifer sent in photos of her art projects using pulp made from old newspapers to make her clay, and her projects were a great success. She used the newspaper because she wanted a rougher texture. Obviously, you will not be able to get the smooth, highly detailed look that you see in the projects in my book without using toilet paper. So – the answer is “yes” you can use other kinds of paper, but the resulting clay will have a different texture. If you’re making a very large sculpture, the newspaper would be much less expensive, and the texture might be exactly what you need. Experiment – and be sure to let us know how your experiments turn out so we can all learn together! Remember – if you don’t see your question in the list above, please ask. Your comments are always helpful to other readers. And be sure you show off the sculptures you make, especially if you use the instructions from the book. The comments section below will allow you to upload a photo of your sculptures, and we would all love to see them. I just wanted to thank you for answering so many questions. It’s so helpful!! Is this PM clay flammable? As part of my project I do need it to burn. I haven’t tried it, but I don’t think it would work very well. The calcium carbonate in the joint compound will probably slow down the fire, if it starts at all. But you could experiment with it. Something made with paper strips and paste will burn. THANK YOU SO MUCH!! I love this technique and the way you teach it! It’s been so fun working with this paste! In the past I made a 3-foot (or so) elephant and a 4-foot tiger. (I’ll hunt for those pix, can’t find right now.) But here’s my latest work: a vintage 😉 life ring for decoration on my mantel. 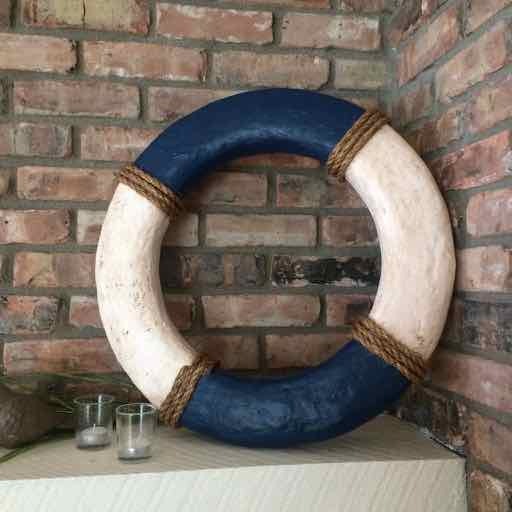 I used left-over construction foam insulation, tape and newspaper, acrylic and latex paint, your PM paste recipe, Annie Sloan dark and clear waxes, and rope from the hardware store. This was so fun! Thanks again for teaching us these techniques! Sorry I posted twice. The first time my photo was too big, but I didn’t realize the text went through. Feel free to delete. 🙂 Here’s some detail on the texture accomplished with the paste and the dark wax. Hi! Thanks so much for generously sharing your work! I’d like to make large round beads (about 2″ top to bottom.) If I make them solid paper clay, will they dry thoroughly or do I need to make some sort of armature that would let air in to help drying? Hi Kat. I havne’t tried doing anything like that. I think there’s a very real chance that you won’t be able to get them dry. The clay dries quickly on the outside, and it can trap moisture down deep. You would need to do some experiments to find out. We get a lot of questions about making beads, but I don’t do that kind of work so I never know how to answer them. If you figure it out, I hope you’ll let us know! What can be added to the clay to discourage the dog from eating it? I finished a great paper ache cat which I bronzed (with paint) put it on the floor and admired for a few days. Looking closer, I found the back half had been eaten! 🙂 Glad he didn’t get sick. But, for my efforts in the future, I’d rather not take a chance. Thank you in advance for your answer. Ann, I have a cat that munches on my sculptures, and it’s beyond annoying. Makes me say bad words, as a matter of fact. But just today one of our readers left a comment that might help us both. She was talking about wild creatures eating paper mache, but if you follow this link and ask her your question, she might be the one who knows the answer. Thanks, Jonni. I’ll try the vinegar. I can’t wait to try the clay recipe and was so glad to come across this blog on Pinterest. So much talent here. Hello! Thanks for sharing your knowledge with us- I’m finding it very useful! I am making a very large sculpture and wondered whether you could make a recommendation on a tape to use prior to applying the clay. The recommendations I’ve seen so far would just be too thin and therefore time consuming. Would a masking or painter’s tape work? Thank you! Hi Sylvia. Yes, I use masking tape for all my projects. Hi Jonni! I am fixing to create pumpkins for our Halloween festival this year and am so excited I found you! I just need to know which paste I need to use…Thank you so much for your hard work and experiments then sharing them with us…. Hi Cindy. If you’re using paper strips and paste, the easiest and cheapest paste is the first on on this page – just flour and water. Be sure to see Rex’s guest post about pumpkins, too. He uses the paper mache clay recipe. Hi! I just bought your book and I’m gathering the materials to start. I’m in the uk and got Unibond ‘no more cracks’ all purpose filler from Henkel (it says ready mixed). Do you know if this will work? I don’t want to open it because Ivan send it back if it’s no good… thank you!! Hi Marian. Thanks for buying my book. I hope you have a lot of fun making your sculptures. I tried to find the ‘ingredients’ of the Unibond online, but I wasn’t successful. However, from reviews on amazon.co.uk, it looks like it might be some form of acrylic product, instead of a gypsum or calcium carbonate product. That means that it probably won’t work with the paper mache recipe. Some of my readers have told us that drywall joint compound is called “joint filler” in the UK. However, the Wickes store is calling it Ready Mixed Jointing Compound. Give your local Henkel store and ask them if they have a similar product. Be sure they know it’s for use on walls and plasterboard. Thank you so much! I may keep this for diy at home and look for a different one on amazon. Hi Rosemary. If you go to the store and ask for a PVA glue, they’ll know what you mean. Any brand will do. I’m going to make some castings of a low relief sculpture I made with your clay recipe. I was just wondering, if I were trying to expedite the drying time of the paper clay, could I add a fast drying medium to the ingredients? The one I’m considering is “Winsor & Newton Artisan oil mixable fast drying medium”? -Thank You for your recipe and your blog. Hi Nate. I think the best way to make the pm clay dry fast is to put it in front of a fan. The fast dry medium you mentioned is for oil paint, so I don’t know if it would help the pm clay dry or not. Try the fan first. Ok. Sounds good. I’ll try the fan. I may apply it in like, an 1/8th inch, or at least a thin layer at first. Thanks Jonni. I was making Horns for a costume using this recipe, not that big maybe 3x2x2 and another set a bit bigger 5x1x1 going by LxWxH. (Inches) Will I have to worry about mold? How would I prevent it? And how long do you think it will take before they fully dry? The drying time depends on how thickly you applied the paper mache clay over your armature. If you used a thin layer and put the horns in front of a fan, they should be dry in a few days. Drying the pm clay as fast as possible is the best way to avoid mold. If you live in a humid environment, you might also want to add a few drops of oil of clove.